Our goal is 100% customer satisfaction 100% of the time. We work hard to make our customers happy and we’re pretty proud of our track record. Following are just a few of our happy customers and what they have to say about our work. I wanted to thank you for the home inspection that you performed for us. After having lived in our home for more than 20 years, I just wanted the peace of mind of having a pro look it over for any issues I needed to be aware of. I was impressed by the thoroughness of your inspection and thankful for the amount of time you spent explaining what you were doing, and for the helpful home maintenance tips you gave us. A1 Utah Home Inspector did an outstanding job of showing and explaining to me their various findings and observations. I will refer Scott Martineau to any of my friends who are in the market for a Home Inspection. Thank you Scott!! People hire home inspectors for a variety of reasons; to protect themselves prior to purchase or to educate themselves on work that needs to be done. Scott, you were very competent in accomplishing these goals. I will recommend A1 Utah Home Inspector in the future to both friends and colleagues who are seeking a professional opinion on their home. Trish and Scott were amazing. Not only did they get me in when they were almost completely booked, they were professional and courteous the entire time. I like that Scott was honest and explained things so I could understand them. I would recommend them to anyone. Had our home inspection completed this past week. Scott did an amazing job! I have worked in the mortgage industry for over 20 years and one thing I have learned is to never use the home inspector that the real estate agent suggests. When an inspector relies on referrals from a realtor they begin to work more for the realtor than they do for you. Scott took over an hour inspecting our home and once we showed up for the walk through he spent another hour walking us through any potential problems. There were items that he pointed out that we would have never caught on our own. Like the furnace was half the size it needed to be to heat our home adequately. If anyone needs a home inspection I recommend A1 Utah Home Inspector. I was so pleased with the entire process. Scott is my go to inspector! He does a very thorough inspection and offers reasonable pricing. My clients are always impressed with his knowledge, professionalism, honesty, and overall job well done. He is quick to get very detailed reports back to my clients and me to make the negotiating for repairs easier. The report has colored pictures and descriptions to help eliminate any misunderstandings between the sellers and the buyers on the repairs needing to be done. Trish is great to work with as well, she gets the inspection scheduled fast and conveniently for my clients. I absolutely love working with A1 Utah Home Inspector! 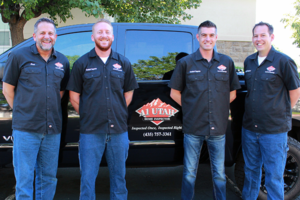 I was highly impressed with Scott at A1 Utah Home Inspector. He took the time necessary to ensure that I understood the issues that he had found. Additionally, he effectively communicated how we could address the issues. This provided us with a thorough understanding of the home. I am fully confident in Scott as a professional and recommend him for anyone considering a home inspection. I was impressed by how thorough and friendly Brock was. He really knows his stuff. He takes you through the house step by step and explains everything very clearly as he goes. Not only was it worth hiring him, he definitely saved me money and hassel by catching something I would have never even thought of. Scott Martineau did a great job on our Inspection. He was honest and thorough. His report detailed things that helped us understand the risks and rewards of what we were getting into. I would highly recommend A1 Utah for any Home Inspection.